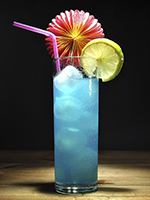 Recipes of 24 blue colored cocktails. - Reviews and Responses. Home › responses › Recipes of 24 blue colored cocktails. 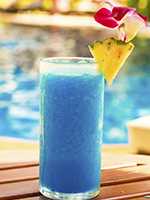 Recipes of 24 blue colored cocktails. If there is one thing that I can never resist is, it is a blue colored drink. Oh, I should add even, red, pink and green too. I simply love to hold colored drinks (be it a cocktail or a mocktail) in fancy glasses and are garnished with fancy stirrers or a peel of lemon or a lovely red cherry. I first spotted this blue color drink mix in a supermarket in Madras several years ago. When I mixed the drink, it was in ink blue color and tasted citrus. Afterward, I never tasted another blue color drink. A few minutes ago, I accidentally stumbled onto a web page that showed several blue colored cocktails (drinks that contain some sort of alcohol, mostly Vodka or Gin). Each of the drink carried their own exotic names that I loved to pronounce just I like to sip it, savoring the color and the taste. I used to discreetly show myself holding the blue drink so that I would get a second glance. What a silly vanity! What exactly do you need to make these lovely cocktails at your home? Go ahead and try any one of the recipes mentioned on the web page above.